This week’s featured photo shows three Grand Illusions colors on one fence. 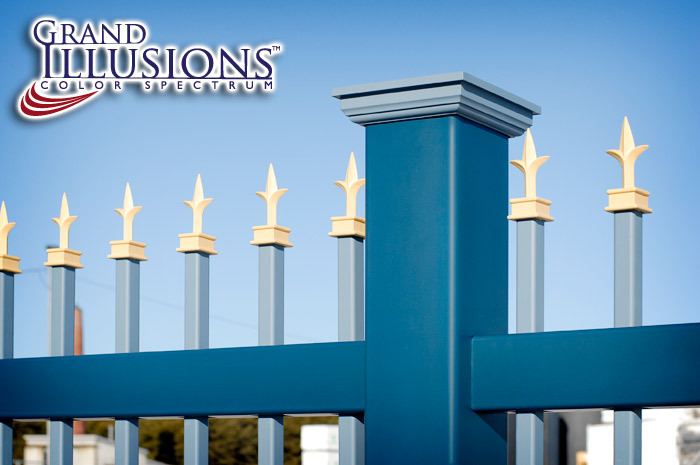 This beautiful V0101-4 Vinyl Ornamental Fence with 1″ x 1″ Pickets and Boy Scout Picket Caps (V11TF) is shown in three different Grand Illusions Color Spectrum Series Colors. The posts and rails are Atlantic Blue (E118), the Boy Scout Picket Caps are Colonial Yellow (E103) and the pickets and post caps are Federal Blue (E102). 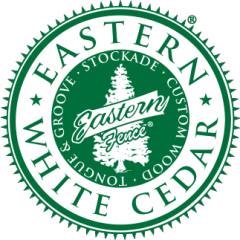 In a world where white fence is the standard, don’t be afraid to be exciting and different. Enjoy using your creativity to come up with your own new and innovative designs. Try out the Illusions Fence Design Center or custom match your trim or shutters. Let yourself come up with fun new ways to spruce up your fence. With 35 color and 5 lifelike woodgrains, Illusions Vinyl Fence’s Grand Illusions Color Spectrum color vinyl fence and Grand Illusions Vinyl WoodBond woodgrain vinyl fence (click for brochure) is sure to be a hit throughout your neighborhood. Illusions Vinyl Fence is sold through a network of quality professional fence dealers throughout the United States. We would ask that you quite simply contact your local fence dealer and ask for “Illusions Vinyl Fence ” by name.